Five different stories intersect on Halloween evening combining in a terrifying lesson that some traditions are best not forgotten. A couple learn that you never blow out a jack-o-lantern before midnight, a group of teens play an evil trick on another unsuspecting teen that goes too far, a high school principal reveals his strange appetite, a group of college girls including a virgin look for the perfect man for her first time and a lonely old man is visited by a very interesting trick 'r treater. "Trick 'r Treat" is everything I could have hoped for in a horror flick. It is a perfect throwback to when horror was both fun and scary instead of just being gruesome. 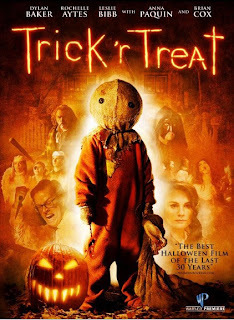 Flawlessly written and directed by Mike Doughtery, "Trick 'r Treat" ressurects the horror anthology genre in a exceptionally executed film interwoven through five haunting tales, combining for one geniunely rousing experience. Not only does each tale provide both great laughs and quality scares, but each are powerfully matched with an eerie tone that is sure to have you completely submersed throughout the jumps, twists and laughs in the 100 minute film. The entire cast of "Trick 'r Treat" is unspoiled. Oscar winner Anna Paquin is perfect as the college virgin in search of her first time on Halloween. Dylan Baker is frighteningly hilarious as the high school prinicpal who, reminds his students to always check their candy. Leslie Bibb and Tahmoh Penikett deliver capable performances as the couple who learn that you never want to blow out your Jack-o-Lantern before midnight. Brian Cox however, stands above the rest in his portrayal of Mr. Kreeg, a old hermitt who never hands out candy. Cox perfectly weheezes his way along as miserly Mr. Kreeg during his sequences with Sam, a very devious trick 'r treater who will stop at nothing to get his candy. That brings us to Sam, you are going to love this little deviant trick 'r treater! Mike Doughtery has hands down created a new horror icon in Sam. The design of Sam is immaculate, he's adorably frightening and ruthless to no end. Every moment he is on screen is pure entertainment and his devilish charm definately wears all the through just like any classic horror icons from our past. Sam also easily becomes the watchdog of Halloween, making sure people in everyday towns are following the rules of the terrifying holiday. "Trick 'r Treat" is an absolute blast all the way through. It is a film that I would watch every year around Halloween and probably even on a regular basis throughout the year. It is as instant classic and an abosulte display of the great imagination from writer/director Mike Doughtery. Doughtery wrote a fantastic script that pays homage to a lighter time in horror, while keeping the film current enough to also appeal to new generations. His execution in direction is perfect and "Trick 'r Treat" easily becomes my favorite horror film of 2009. The true disappointment is that Warner Brothers has yet to ever give this film the theatrical release it deserves sitting for nearly three years. "Trick 'r Treat" is the kind of film that would only benefit from a theatrical release, one that gains crowd enthusiasm and would build a following. This film would be loved by millions and would become a sure classic in the horror genre, if given the right marketing strategy. Warner Bros who have been weary of the current Saw series, which has plagued Halloween release dates for too long, should give this film a proper theatrical release. Especially when considering the buckets of money WB has raked in on both last year's The Dark Knight and this year's Harry Potter and the Half Blood Prince. With a budget of only $12 million, "Trick 'r Treat" would quickly make it's money back and then some for the studio, leaving them happily surprised by the turnout the film could recieve. Instead, the majority are stuck waiting for the DVD release date, which is set for October 27th.